A marvellous musical about minibeasts that's exceptionally cute and entertaining - and informative too! Supports the KS1 science curriculum (see 'Freebies' tab at the foot of this page) and reinforces PHSE teaching about prejudice and diversity. Sure to be an audience-pleaser. Night draws in and Lucy is frightened. A family of stag beetles offer to look after her, but her mum has told her NEVER to talk to stag beetles because they look scary. However, the stag beetles are so kind and look after Lucy so well that she realises she can trust them. When her mother eventually arrives, Lucy’s in trouble – but she protests that the stag beetles have kept her safe. Mrs. Stag Beetle tells Lucy’s mum: ‘We’re just like you inside.’ Mrs. Ladybird comes to see that they’re all part of one big beetle family and decides they can all be friends. SPECIAL OFFER: Buy 'The Not-So-Creepy Crawlies & 'Flutterpillar' together for just £49.90 (see below). 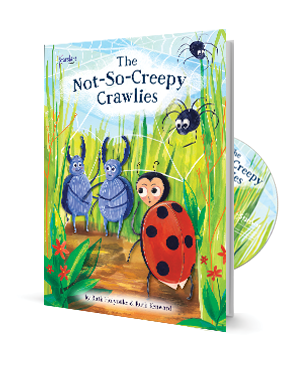 Claire Hollocks – Vocal Teacher (Birmingham Services For Education) The greatest strengths of ‘The Not-So-Creepy Crawlies’ are the humour, the message, the scientific information and the age-appropriate songs with helpful CD backing tracks. The woodlouse and dung beetle songs were probably their favourites. The children enjoyed putting on the show, and the audience were very appreciative. Very good. Alison Bendall – Y1/2 teacher, East Sussex A very entertaining musical for KS1 that has a good balance of songs to speaking/acting for this age group. There was plenty of scope to put our own ‘spin’ on things, and the children enjoyed the show very much, as did the audience. The content includes lots of facts about minibeasts that we didn’t already know, so that helped alongside the science curriculum. 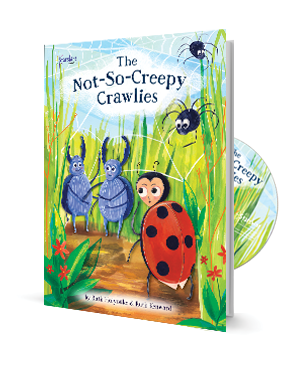 Bethany Reid – Reception Teacher, Birmingham The parents were really proud of reception for taking on a performance of ‘The Not-So-Creepy Crawlies’ at such a young age. The children particularly enjoyed putting it on because we have been doing about minibeasts this half term. It fitted in well with our topic to be learning the different facts in the songs – which were enjoyable to sing. The highlight was watching the children excel in their performance and the way they learned their lines and song words. They took to the roles really well. Katie Wells, Year 2 class teacher, Birmingham There are a lot of songs, but the quality of them is really good, and it was great to have the CDs to use in the classroom. I would definitely use it again when teaching minibeasts in Science – and would teach each song as a stimulus at the start of a lesson.